The magnetic opening system provides simple and rapid access to treats. With an overall volume of 650ml, there is plenty of space for a couple of days worth of treats! "A well made treat pouch. A good size, not too big , not too small. Magnetic closure works well." "This treat bag is great. It holds more than you'd think. Plenty to get my Rotty through her hour of dog school. It's easy to fill and the magnetic snap top makes it easy to use." 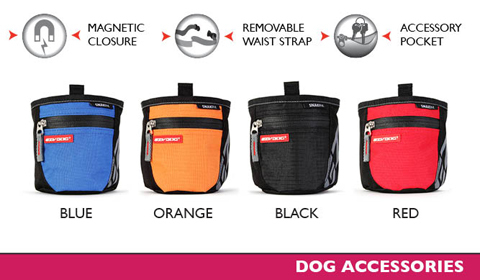 "Nice training pouch, smaller than the 'pro' version, so if you are planning serious training with multiple dogs, opt for the larger version. For your average pet person this is fine though." "I have been looking for a treat bag for a couple of years and got really excited when I saw one on the Ezydog website. Years ago I made the decision to only buy Ezydog collars and leashes for my 2 Springer Spaniels for at least two reasons: the products last the lifetime of the dog and having two dogs that are in and out of the sea, the D rings just don't rust! So I bought the Snakpak Treat Bag from the website in the anticipation that it would be the same quality as the other Ezydog products I have bought. I am not disappointed, I love it. And it arrived at my door in record time! Ezydog can do no wrong in my eyes"